My last post for this year. This entry was posted in Uncategorized and tagged varia on December 22, 2010 by bramb. Recently several new papers have been published by colleagues, of which I here mention two related to Neotropical land snails. The first one is a paper by Barrientos (2010) on the terrestrial malacofauna of Costa Rica. It is a review, summarizing the different aspects of our current knowledge. Up till now, 135 species are known and despite this being one of the more well-known countries, it is expected that the total number of species could rise up to 400. The percentage of endemism is 30%. There are two main reasons: a) the biology, genetics and distribution are unknown for the majority of the taxa, and ‘cryptic’ species might be unveiled once our knowledge progresses; b) the highland areas are relatively under-sampled, and new taxa of micromolluscs (especially Euconulidae) are expected here. 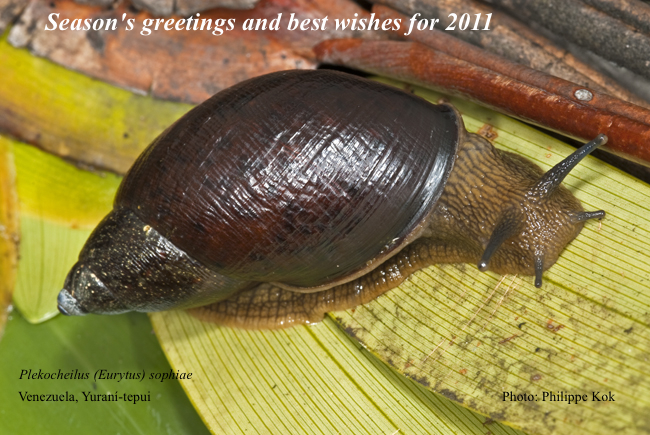 The second paper is summarizing our knowledge on snail and slug eating snails in Brazil. Snakes of the Dipsadidae have been regularly observed to feed on slugs (Veronicellidae spp.) and occasionaly on snails (Drymaeus interpunctus, Brabybaena similaris). This is documented by photographs, of which several not published before. Agudo-Padr? ?n, I., 2010. 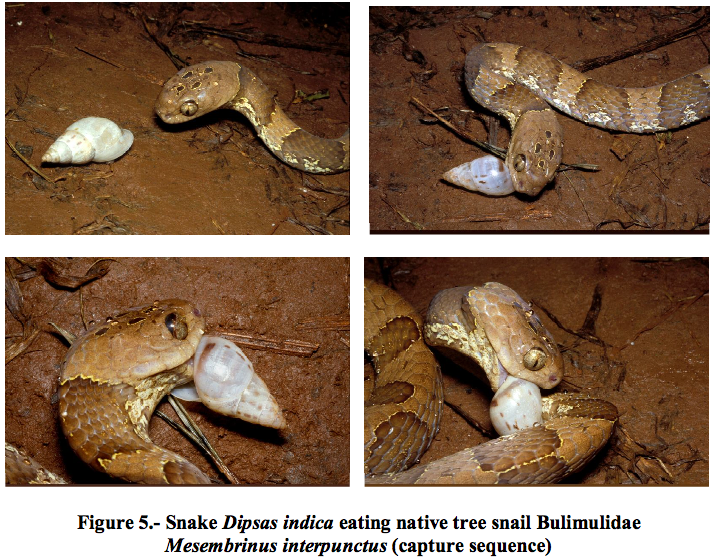 Continental terrestrial molluscs (Gastropoda, Gymnophila & Pulmonata) components of the Brazilian snail-eating snakes (Reptilia, Serpentes, Dipsadidae) alimentary preferences: introduction to its study and preliminary available data. Noticias Malacologicas (http://noticias-malacologicas-am.webnode.pt/malacofagas/). Barrientos, Z., 2010. Los moluscos terrestres (Mollusca: Gastropoda) de Costa Rica: clasificaci? ?n, distribuci? ?n y conservaci??n. – Revista de Biologia Tropical 58: 1165-1175. This entry was posted in Uncategorized and tagged brazil, costarica, literature on December 20, 2010 by bramb. One of my discoveries in the Dautzenberg archive was a series of folders, each containing one or two letters from correspondents of Dautzenberg. He had written the name of the person on the folder, sometimes with an explanation of the position that person held or other notes that were of interest. Here is an example of C.F. Ancey. Ancey is one of the persons who interested me, as Wood & Gallichan (2008) already published on the types from the Ancey collection that are present in the Brussels museum. However, they didn’t figure any of these types. Since a good portion of handwritten text may be helpful to identify labels in historical collections, I will not only document the type material but also some of these autographs that are relevant to the paper I’m currently writing. Here is the example of Ancey’s handwriting. Other persons to be included are H. Crosse, H.C. Fulton, A. Morelet, and H.B. Preston. Furthermore, labels found in the handwriting of A. Cousin and P.H. Nyst will be figured. Wood, H. & Gallichan, J. (2008) The new molluscan names of César-Marie-Félix Ancey including illustrated type material from the National Museum of Wales. Studies in Biodiversity and Systematics of Terrestrial Organisms from the National Museum of Wales, Biotir Reports, 3, i-vi, 1-162. This entry was posted in Uncategorized and tagged biohistory on December 15, 2010 by bramb. In my last paper, I quoted an obscure paper of Whetherbee & Clench (1987) on the Hispaniolan non-marine malacofauna, published privately by the first author and posthumous for the second author. It is a paper that is very difficult to access, and I was glad that some colleagues from the Museum of Comparative Zoology in Boston provided me with a copy. Without further comments. So I made the reference, as papers privately published are rare but not suspicious a priori. Fred Thompson kindly made me aware that I shouldn’t have referred to this publication. He wrote: “The paper by Wetherbee & Clench does not merit citation as a publication. It was a mimeographed document. It was based on a card-file assembled by Clench over a 30 year period. It was merely a list of names and citation taken from the literature, and Clench made no attempt to edit or change any of the information in the card-file. Wetherbee found the file in the MCZ several years after Clench died. He compiled the MS verbatimfrom the card file and made no attempt to update the nomenclature nor revise any of the information in the card file. He was advised by several people not to publish the document, especially under Clench’s name, because we felt that Clench would never have endorsed the manuscript. Unfortunately, Wetherbee did “publish” the list, and he sullied Clench’s name in the process“. It seems to be an unfortunately episode in American malacology, of which I didn’t know so far. This entry was posted in Uncategorized and tagged publications on December 14, 2010 by bramb. These pictures are of a Drymaeus (Drymaeus) species that Adri? ?n Gonz? ?lez spotted near Tandapi, Prov. Pichincha, Ecuador. Although it is difficult to be certain without a ventral view and measurements, it looks very much like D. (D.) petasites (Miller, 1878). Thanks Adri? ?n, for sharing these pictures. This entry was posted in Uncategorized and tagged drymaeus, ecuador on December 13, 2010 by bramb. Last weekend I was in Brussels, visiting the exhibition ‘A Story of Deception’ by the Belgian/Mexican artist Francis Al??s. 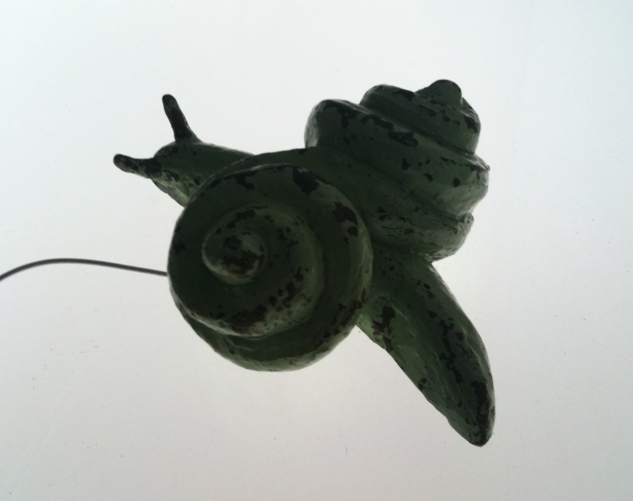 One of the items that stroked me was this snail-like creature as a piece of art. Francis Al? ?s lives in Mexico City, where he wanders through the streets. He then became aware that waste is recycled in different forms before it finally ends on a dumping site. He decided to create several objects, of which this snail was one, to see if he could trace them in the flea markets being held in several places in the city. Of the seven objects this snail was one of the three he could trace back. The exhibition stays until 30 January 2011 in WIELS, Center for Contemporary Art (http://www.wiels.org/site2/home.php). Impressive and worth a visit for those readers who may pass by Brussels during this time. This entry was posted in Uncategorized and tagged art, varia on December 12, 2010 by bramb. Last week a new paper was published. It has been added in my publication list (www.ashbreure.nl > Welcome > Publications). The paper deals with the taxonomy and anatomy of Coloniconcha prima Pilsbry, 1933 from Hispaniola. As I’m not allowed to place the PDF on my website, it is available on request. This entry was posted in Uncategorized and tagged anatomy, dominicanrepublic, haiti, pleurodontidae, publications on December 10, 2010 by bramb.